Most of our readers are probably aware of the the "Nazi mother" from Winnipeg who's children were removed from her and her then husband's home by Child and Family Services soon after her return from Calgary in March. "Nazi Mom" and "Nazi Dad" had been attending the Aryan Guard's "White Pride" march that month. Due to the publication ban we can't name the two parents involved, however the American-based One Peoples' Project ran a story today which provides more information. "Nazi Mom" has claimed that she's not an advocate of racial hatred, however her posts as Aryanprincess1488 would beg to differ with that claim. We reported earlier that a member of the Aryan Guard was involved in the assault of a young Japanese woman in Calgary in July. Since the individual in question is 17, we will not report his name. This past Thursday (January 22) saw a continuation of the Warman libel suit against Mark and Connie Fournier and Free Dominion. This particular hearing dealt with the identities of the,“John Does” (though at least one is not such a John Doe any longer) who are also named in the suit. The Fourniers, through their attorney Barbara “Babs” Kulaszka, were presenting arguments as to why they shouldn’t have to comply with their legal obligations under the Ontario Superior Court’s rules of procedure which states that they are required to disclose all information about the John Does. It should suffice to know that the arguments offered so far seem less than compelling, at least to us. Our favourite part of the hearing is Babs Kulaszka’s argument that the Fourniers can’t release the email addresses of the users of FreeDom because if they were to disclose the email addresses of the John Does, then someone would then be able to track them down. Oh, Kevin Goudreau. We wish we knew how to quit you. Don’t worry dear readers. The tenuous connection between low level bonehead Kevin Goudreau and the the Macdonald v. CBC/Kinsella trial will occur soon enough. Please bear with us for the time being. First the meat, then the desert. We’ve been following the defamation trial of Warren Kinsella and the CBC that was filed by Ian Verner Macdonald for the better part of a week now. Even though the burden is on the CBC and Kinsella to show that the factual statements made in the Kinsella interview were true and the rest fair comment, it seems that Macdonald in his cross-examination came across as pretty much what the allegations about him put forward, thus helping the defense's case more than his own. If one had to compare this case to a similar trial, it would perhaps be best to compare it to the Irving v. Lipstadt trial where Irving bravely running himself upon his own sword in a Romanesque suicidal act of, “they won't push me around” bravado. Perhaps the comparison is even more appropriate here since Macdonald's revelation that Mcquirter the KKK leader gave him an SS sword in thanks for letting him flop at his places in Ottawa. 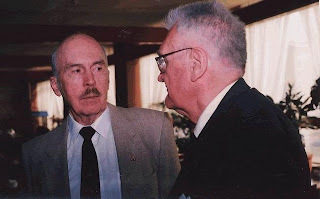 Many of our readers are aware of the book written by Warren Kinsella entitled, Web of Hate which details the personalities on the Canadian racist right. One individual linked to members and movements discussed in Mr. Kinsella's book is Ian Verner Macdonald, a former Canadian trade commissioner in the Foreign Service. MacDonald is currently suing Kinsella and the CBC, "because of comments Mr. Kinsella made on a CBC call-in television program on April 19, 1996. The program's focus was on right-wing militia groups, and Mr. Kinsella had published a book on the subject in 1994." "...organizers have to know that the participation of...any other hate group...be that group Christian...is absolutely unacceptable"
Looks like racists hang out at Anti Racist Canada. Calling Christians a hate group is wrong and just shows how racist you are! This messages was in response to our article stating our position on Gaza and the involvement of the Aryan Guard in the rally for Gaza this past Saturday. Crutcher posted the same message on BigCityLib's blog as well. It would seem that Mr. Crutcher is both dishonest and an idiot.